Welcome to Magic Morgan Website! Prepare for eye-popping illusions, dazzling balloon twister, stunts with live animals along with seemingly impossible tricks in an unusual and incredible display of magic when award-winning magicians Magic Morgan and Liliana take the stage. Try solving some of their magical mysteries as they bring a smile to your face with their mind-boggling performance. Magic Morgan & Liliana will amaze and astound you, make you laugh, and make you wonder. Their show is a theatrical event for the entire family, full of moments that take your breath away. Objects seem to appear from nowhere and defy gravity. The broken appear to be made whole. Magical objects defy gravity. People of all ages can enjoy Magic Morgan & Liliana's Grand illusions, live animals, comedy and audience participation. Join them for a unique, magical journey with a powerful message that creates memories for a lifetime. We also provide customized shows, and can give a 10-minute warm-up or opener act, or customize a full show anywhere from 30 to 90 minutes. If you like magic, comedy, and illusion, you'll want to catch all the shows at the Little MAGIC Theatre! Schools and libraries | Fairs and festivals | Cruises | And more! By 2013, Matthew and Liliana had been performing for more than 20 years around the world. It was time to begin looking for a theater space where they could perform in a more permanent location instead of traveling as they had for so long. After many months of looking, they found a wonderful space located in the heart of the historic downtown in Lake Geneva, Wisconsin. Having grown up in nearby Delavan while attending the Wisconsin School for the Deaf, Matthew knew this would be a perfect place to bring together visitors, local community, and magic enthusiasts of all ages. The Little MAGIC Theatre is an intimate 50-seat theater, bringing the finest magicians and variety acts from around the world all year long. If you like magic, comedy and illusion, you'll want to catch all the shows at the Little MAGIC Theatre! We'd love to see you in the audience. You will be entertained -- we promise! Matthew 'Magic' Morgan has had a long, storied career that started when he was six years old. After learning a coin trick from his grandfather'who had worked during a carnival at one time'Matthew began performing and hosted his first show, charging neighborhood kids 25 cents. He began learning tricks and studying magic. When he was 11, he got paid to perform at a church ' his first paid magic performance. He, of course, used this money to buy more magic supplies. Liliana, born in Russia, has been delighting audiences throughout Europe for more than a decade. Her appearances on stage incorporate Russian culture and dance. She started learning Magic when she was 20's years old and now teaches Russian Sign Language. It was at one of Matthew's performances in Russia that she met, and eventually married, Matthew. And Beautiful Two Children. 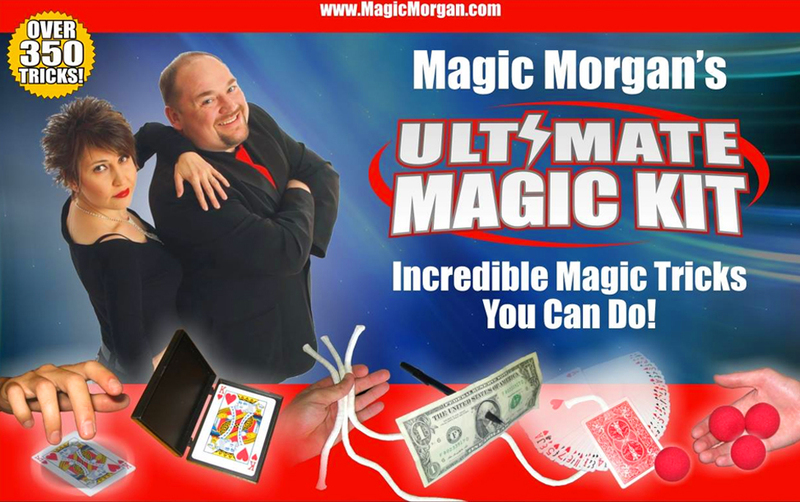 The Magic Morgan Ultimate Magic Kit comes with the greatest tricks of the trade so you can become a great magician! Learn over 300 tricks with this kit, including card tricks, rope tricks, multiplying objects, and even making objects levitate! "I've had 7 or 8 magicians here in my 17 years and you were the best." "Magic Morgan was a blast to work with! They arrived early to set up, and was ready to go on time! Magic Morgan & Liliana provided great entertainment to both children and parents. I would definitely recommend Magic Morgan to anyone who is looking to have a fun, family-friendly event!" "In my over 30 years of hiring performers for our summer library programs Magic Morgan & Liliana put on the finest magic show I have seen. First rate program that thrilled the audience both young and old." "Magic Morgan & Liliana are true artists and professionals of their craft. Their act is unique and always full of surprises for audiences of all ages. A delight to see and work with time and again." "Absolutely Amazing! Magic Morgan & Lilana's Show was a hit. This is their second time performing for us. This was not only enjoyed by the K-12 students who were our special guests, but the adults in attendance were equally entertained and enjoyed the show. Smiles and laughter filled the auditorium. Thank you for coming to our school. We are huge fans!!! We look forward to our next booking." "Magic and Liliana Morgan are one of the best performers I have seen. Children and adults alike will be captivated. 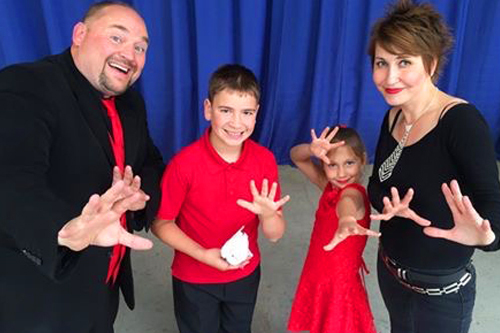 They are definitely our family's favorite magicians. Hurry and book those magicians for your events!" "Las Vegas is the Magic Capital of the World'.Magic Morgan and Liliana bring Magic Capital of the World to every Show, Anywhere!!! Best Show!" "You both gave excellent performance to hearing people. Most of them enjoyed your work! Excellent magic! ??" "Matt really made a difference to so many families who don't speak English and the parents had as much or more fun than the kids. I haven't laughed so hard in a long time!" "Matthew Morgan is really one of the best Magicians I have ever seen. He knows how to entertain all types of audiences for any kind of occasion. His magic performances are close to the famous David Copperfield's. Matt has a charismatic personality. And he fascinates audiences of all ages with his close-up. On-stage magic. Everyone must see his wonderful magic show!" Magic Morgan & Liliana combines the art of illusion and comedy to give his audiences a program of wholesome family entertainment. Humor, magic, mime, and more! Prepare to be dazzled. All images is taken by Magic Morgan. To promote our images please contact us in order to use the current images.